Apparalang beach is one of destinations in Bulukumbu that increasingly popular today because of the sound of social media. 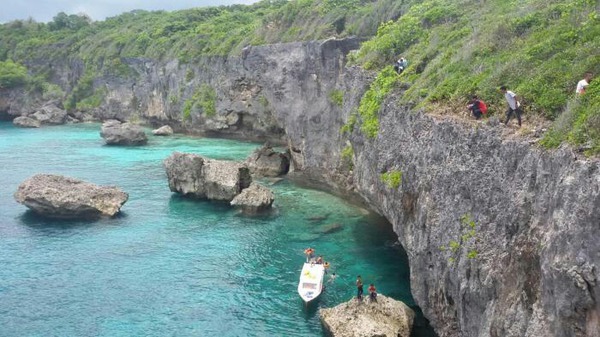 People said that this place is have similar beauty to Raja Ampat in Papua. Together with Tanjung Bira and Bara Beach, Apparalang beach is have the same beauty and worth to be visited. The transportation to Apparalang beach is just the same with transportation to Tanjung Bira. It is adviceable, if you want to Apparalang better use bike ride or motorcycle because the track is rather steep and rocky. There are plenty of bike rental in Tanjung Bira, the prices are vary from Rp.50K- Rp.70K. Apparalang beach is located in the village of Ara, District Bontobahari, Bulukumba regency. The location is just the same to Tanjung Bira. Five kilomenter before arriving at the Tanjung Bira or rather before passing through Lahongka decline, you will get a fork road (SMK 6 Shipping high school Bulukumba). From the T-junction, then turn left towards the village of Ara. After a left turn from the road axis to Tanjung Bira, then you will pass through the front of the school SMK 6. About four kilometers from the junction you will get the gate Apparalang Beach on the right. There are no permanent food stall at this place, the better to have and bring your own food and drink. Otherwise, if you are visiting this place during weekend or holiday season, there will be food seller around the beach. What makes this place special? From a distance you will be presented a coastline landscape that is so neat and clea. Apparalang beach is a cluster of rock with the typical colors of the sea, some said as Apparalang Cliffs. In addition, there are some chunks of rock that broke away from the main rock. Those who love photography, Apparalang beach is a great place to shoot every moment and frame. Every corner has its own beauty, depending on how you take the shot. In addition, for those who like adrenaline rush, jump off the cliff is the answer for you. Wanna try?